MANSFIELD — Driving in the winter means snow, sleet and ice that can lead to slower traffic, hazardous road conditions, hot tempers and unforeseen dangers. To help you make it safely through winter, here are some suggestions from the National Safety Council to make sure that you and your vehicle are prepared. At any temperature, weather affects road and driving conditions and can pose serious problems. It is important to monitor forecasts on the Web, radio, TV, cable weather channel, or in the daily papers. • Checking the ignition, brakes, wiring, hoses and fan belts. • Changing and adjusting the spark plugs. • Checking the air, fuel and emission filters, and the PCV valve. • Checking the tires for air, sidewall wear and tread depth. • Checking antifreeze levels and the freeze line. An emergency situation on the road can arise at any time and you must be prepared. In addition to making sure you have the tune-up, a full tank of gas, and fresh anti-freeze, you should carry the following items in your trunk: Properly inflated spare tire, wheel wrench and tripod-type jack; Shovel; Jumper cables; Tow and tire chains; Bag of salt or cat litter; Tool kit. Be prepared with a “survival kit” that should always remain in the car. Replenish after use. Essential supplies include: Working flashlight and extra batteries; Reflective triangles and brightly-colored cloth; Compass; First aid kit; Exterior windshield cleaner; Ice scraper and snow brush; Wooden stick matches in a waterproof container; Scissors and string/cord; Non-perishable, high-energy foods like unsalted canned nuts, dried fruits, and hard candy. In addition, if you are driving long distances under cold, snowy, and icy conditions, you should also carry supplies to keep you warm such as heavy woolen mittens, socks, a cap and blankets. The best advice for driving in bad winter weather is not to drive at all, if you can avoid it. Don’t go out until the snow plows and sanding trucks have had a chance to do their work, and allow yourself extra time to reach your destination. If you must drive in snowy conditions, make sure your car is prepared (see Winterize Your Car below), and that you know how to handle road conditions. It’s helpful to practice winter driving techniques in a snowy, open parking lot, so you’re familiar with how your car handles. Consult your owner’s manual for tips specific to your vehicle. • Don’t assume your vehicle can handle all conditions. 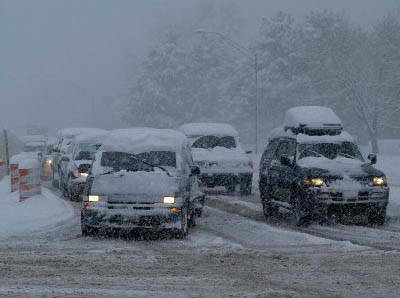 Even four-wheel and front-wheel drive vehicles can encounter trouble on winter roads. • As the wheels skid sideways, they will slow the vehicle and traction will return. As it does, steer in the direction you want to go. Then put the transmission in “drive” or release the clutch, and accelerate gently. • Do not spin your wheels. This will only dig you in deeper. • Turn your wheels from side to side a few times to push snow out of the way. • Use a light touch on the gas, to ease your car out. • Pour sand, kitty litter, gravel or salt in the path of the wheels, to help get traction. • Try rocking the vehicle. (Check your owner’s manual first — it can damage the transmission on some vehicles.) Shift from forward to reverse, and back again. Each time you’re in gear, give a light touch on the gas until the vehicle gets going. • Do not leave your car unless you know exactly where you are, how far it is to possible help, and are certain you will improve your situation. • To attract attention, light two flares and place one at each end of the car a safe distance away. Hang a brightly colored cloth from your antenna. • If you are sure the car’s exhaust pipe is not blocked, run the engine and heater for about 10 minutes every hour or so depending upon the amount of gas in the tank. • To protect yourself from frostbite and hypothermia use the woolen items and blankets to keep warm. • Keep at least one window open slightly. Heavy snow and ice can seal a car shut. • Eat a hard candy to keep your mouth moist.